Since the introduction of regular speed checks by the police, you always have your eyes glued to your vehicle’s speedometer for fear of exceeding the speed limit. 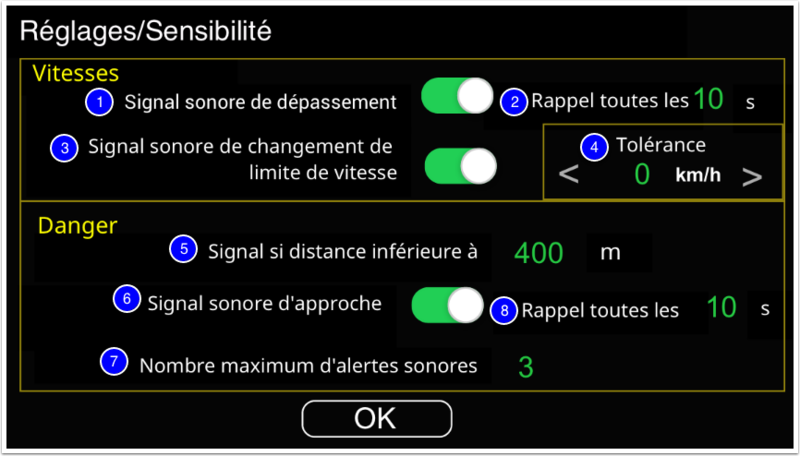 When you do the same daily route of several kilometres, you would like to have an assistant to signal the exceeding of the speed limit on the section of road which you often take.If this assistant warns you as a friend of potential dangers a few hundred metres before, you will probably be even more “Zen on the road”. Assistants of this type exist but they are generally expensive (several euros or dollars for a monthly subscription). Some applications are free but often require an internet access for a real time update of the traffic information. Internet access can be very expensive with the cost of ‘roaming’ if you are temporarily in a foreign country. Sometimes, these information updates are not always free. (1) Angle in degrees of the vehicle relative to the North. (2) Illustration of this angle with picture. The vehicle is going east. 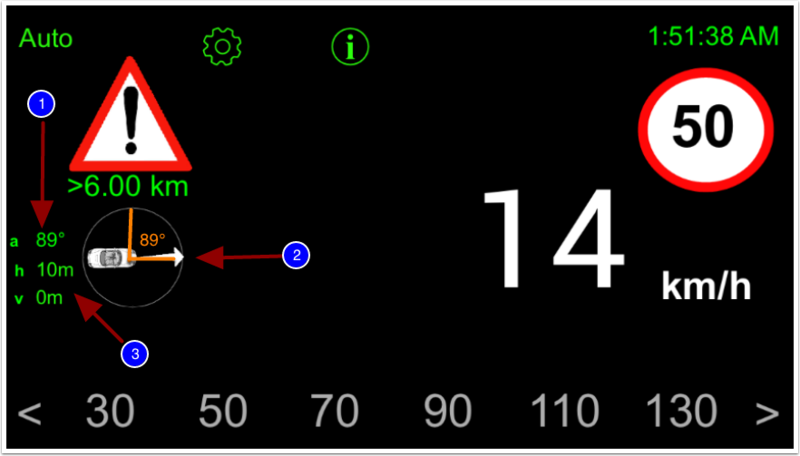 (3) Horizontal (h) and Vertical (v) accuracy of GPS. 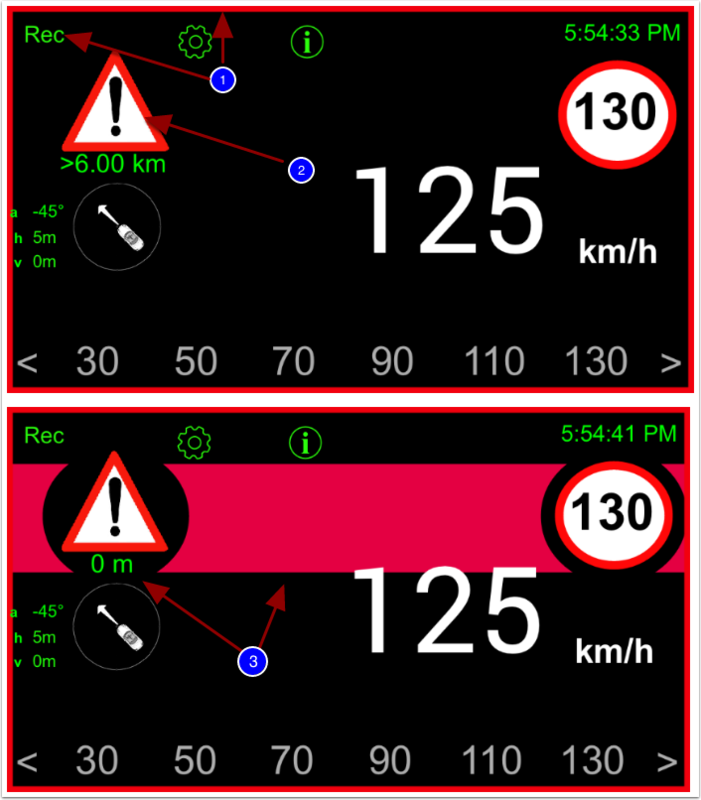 (1) The nearest danger is at a distance superior to 6 kms. Your vehicle runs at 116 km / h while the speed limit is 110 km/ h. The two thirds of the screen are orange. 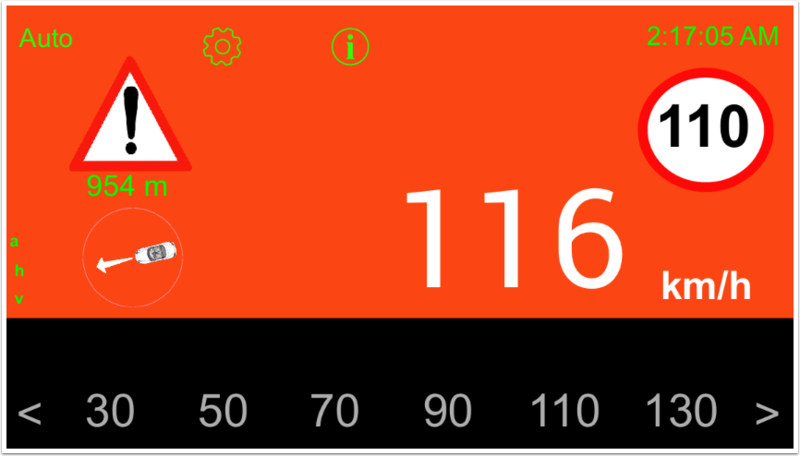 A speeding warning sound is played when the speed limit is exceeded. This sound repeats every 10 seconds (default value can be changed). Your car is 365 meters from a registered danger (by yourself). The red banner indicates that you are within 400 m (default value can be changed). A danger alert sound is played. This sound repeats every 10 seconds (default value can be changed). Your vehicle runs at 97 km / h while the posted speed limit is 90 km/h. You are 55 m from a danger zone. The two beeps (speed and danger signaling) are there to remind you. (1) No fixed maximum speed. (2) Touch the desired speed limit here 50. 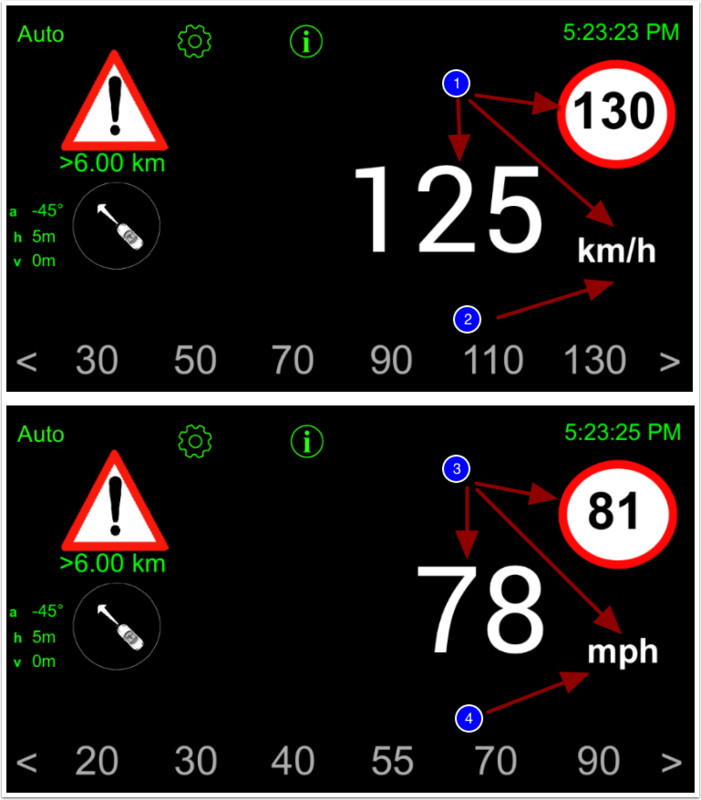 (3) The maximum speed is now set to 50. (1) The speed limit is 130 km/h. The speed of the vehicle is 125 km/h. (3) The speed limit is 81 mph (equivalent to 130 km/h). The speed of the vehicle is 78 mph. Recording is only possible when the application is in Rec mode. Tip: To avoid unwanted recording, do not stay too long in ‘Rec’ mode unless you are traveling on an unknown road in the ‘Zen on the Road’ database. (3) The application is in Rec mode. It is recognizable by the red rectangle surrounding the navigation dial. (1) The application is in ‘Rec’ mode. (2) Touch a speed limit. The application will emit a sound to indicate that the memorization is done. Tip: Touch the speed panel a second before your car get to the panel. 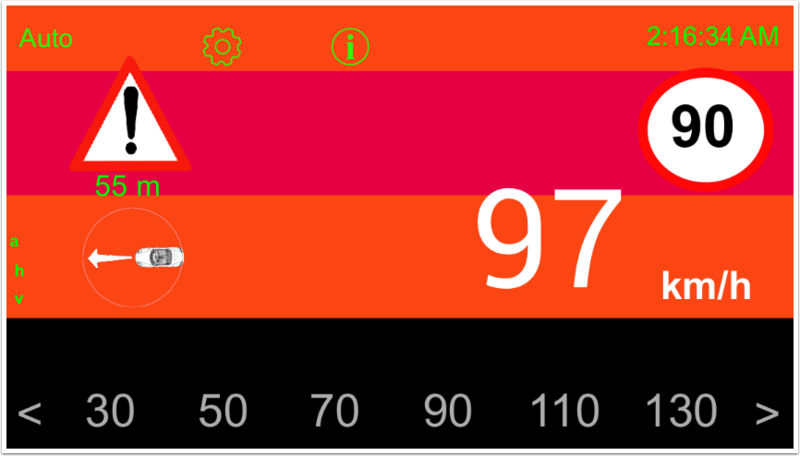 (3) After the operation, you will see that the reported danger is at 0 m. The red banner corresponding to the danger appears. And the danger sound signal is played. It makes it possible to respect the regulations in use in France. A young driver must not drive at more than 80 km/h if the speed limitation is set at 90 km/h. On the motorway, the young driver must not exceed 110 km/h when the speed limit is set to 130 km/h. 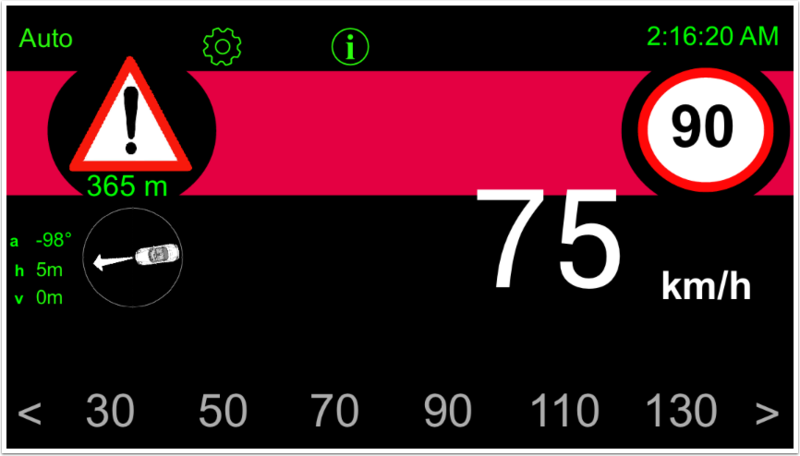 (1) The “Young Driver” mode is indicated by the appearance of this picture. 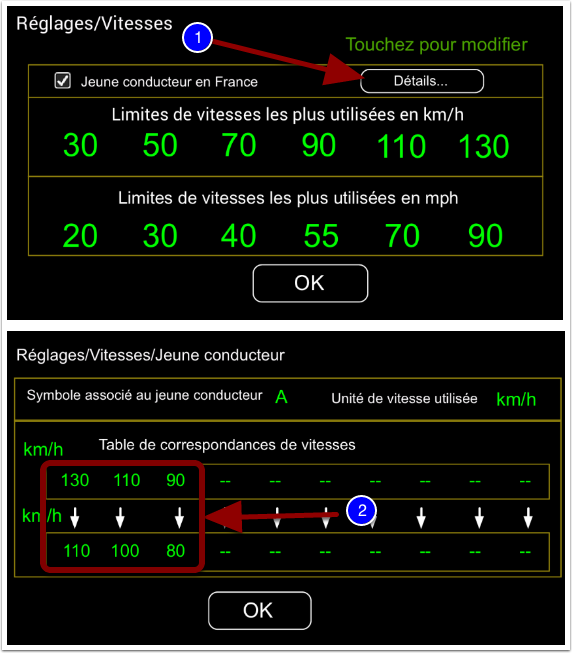 (2) The correspondence table indicates that for a young driver, the panel 130 is brought back to a speed limit of 110 km / h. The panel 110 gives a speed limitation at 100 km / h. And panel 90 acts as a limitation at 80 km/h. 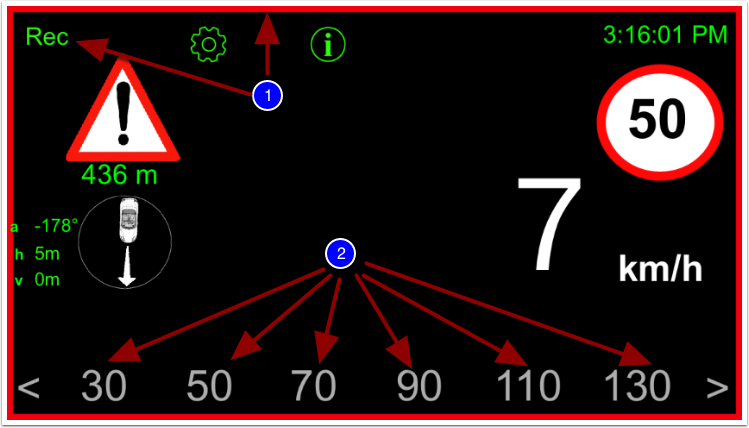 It is not yet possible in version 1.2 of ‘Zen on the road’ to modify the elements of the screen ‘Settings / Speeds / Young driver’. (1) The speeding sound is sent when the vehicle’s current speed exceeds the limit. 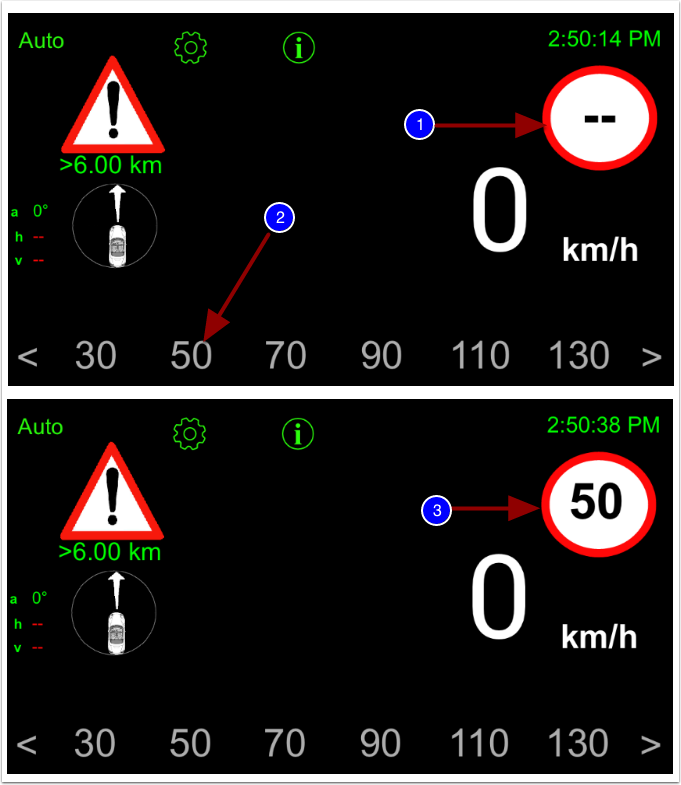 (2) To allow the driver to return at a reasonable speed, the 10 second delay (changeable value) is given. If the speed is still excessive at the end of this period, the speeding signal will be sent again. 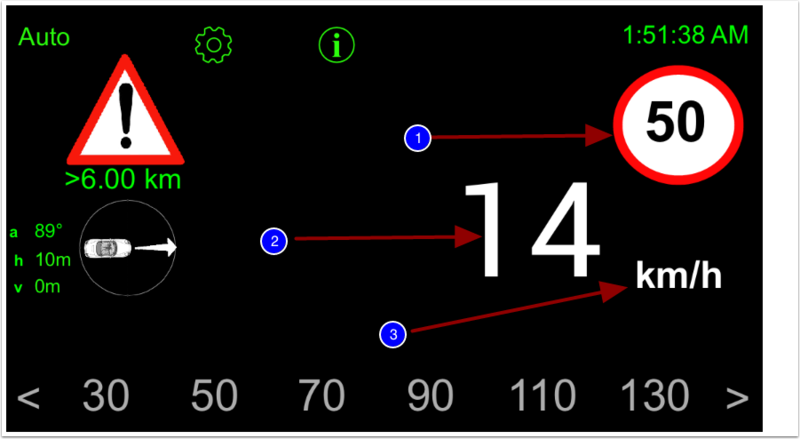 (3) The automatic mounting sound signal of a speed is sent to signal an automatic speed change. The application detected in the base the existence of a speed limitation panel that must be mounted. Caution: When a series of panels is mounted in a very short time interval, only one sound signal is sent. (4) The tolerance is set to 0 km h and 0 mph by default. Caution: These 2 tolerances are set separately. If a tolerance of +1 km/h is set, then for a speed limit of 90 km/h there is a warning when exceeding (90 + 1) km/h, ie 91 km/h. 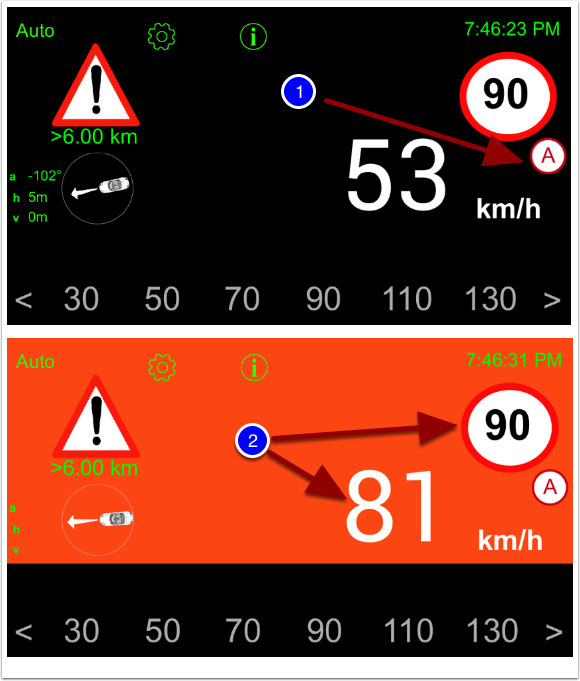 In ‘Young Driver’ mode, there is a warning at (80 + 1) km/h. Be careful not to abuse this tolerance. (6) The danger zone proximity sound signal can be activated or not. It is enabled by default. (7) This danger is alerted 3 times (changeable value). It is better not to increase this value because you would have the impression that the application insists heavily. (8) The time interval between two hazard proximity tones is set to 10 seconds by default. 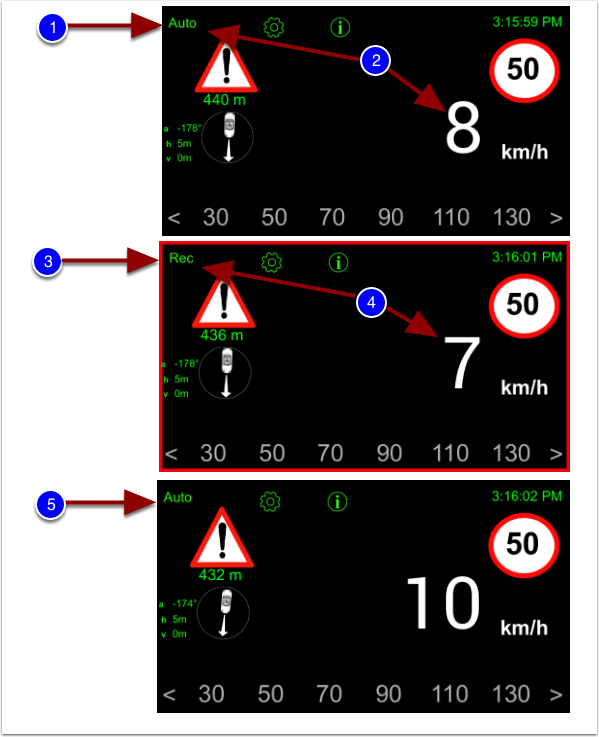 The application can record the points (speed and danger) in Rec mode in 5 separate ‘files’. (1) By default, the file used is the file called ‘principal’. This value can be changed. If you are using another file, the file name will appear in the navigation screen. (2) 0p – 0 d: means that there are 0 speed panel and 0 danger recorded in this file. 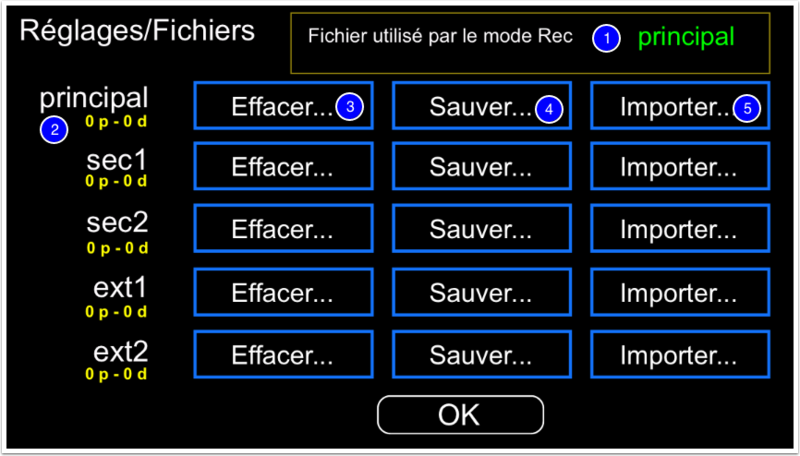 (3) The ‘Delete …’ button, as its name suggests, allows you to delete panels and hazards. The application will propose to you to remove all the dangers, all the panels, or both at the same time. (3) The ‘Save …’ button, as the name suggests, allows you to selectively save panels and hazards. For the moment, the backup is done by an email generated by the application that you will have to send. It takes for the backup to have already configured your Mail client on your smartphone. This email will contain a text file with all the information you need. (4) The ‘Import …’ button allows you to retrieve data from a web server, you will have to give the html link of the file. There is another way to recover data generated by this application: just ask the operating system of your smartphone to open the recovered text file with ‘Zen on the road’. Why different files? You are, for example, on vacation in a place where you use a car and you need the help of ‘Zen on the road’. If this place is not a place where you will not come back at all, it would be more appropriate to use the file ‘sec1’ for storing this information. You can then delete them at the end of your holidays. The files ‘ext1’ and ‘ext2’ could be powered from data retrieved by friends.